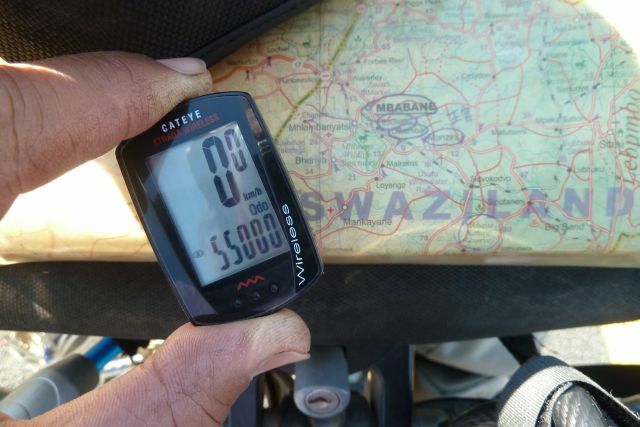 I’m on the road to Swaziland which runs through the extensive timber plantations, the cycle computer on my handlebar reads 55,000km. I had thought it was just a pass point for me but I became pensive when it read 54,999km and something that I had not recalled for a long time abruptly came to mind. 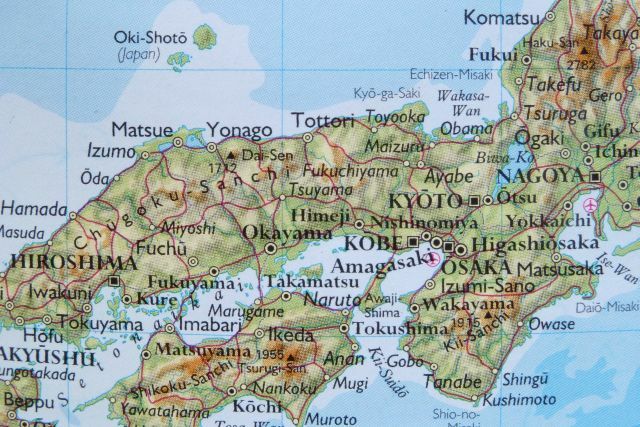 In 2003 in Japan, a decade ago, I had embarked on a bicycle tour of western Japan from my home in Kanagawa, next to Tokyo, from late January through to mid-March. Having survived a snow storm in Hokushinetsu during midwinter while dissolving the frozen chain with hot water, one rainy day in February I arrived in Yonago, a main town of western Tottori prefecture, in the Chugoku region. I had been fortunate enough to stay at the apartment of a senior staff member, of which company I was supposed to be a new recruit coming April. At a certain moment I sensed the need and rushed into the toilet. After taking a seat and recovering my composure, I picked out a book from the small bookshelf in the toilet with my forefinger. This was my first encounter with “Yatta”, the title of the book, written by Tatsu Sakamoto, a Japanese who had done his 55,000km round-the-world bicycle tour from 1995 to 1999, maybe “I made it” or so if I translate without asking the author, which strongly inspired me and turned out to make me have a thought of this journey though it wasn’t until some years later that I could actually decide to bring it into reality. 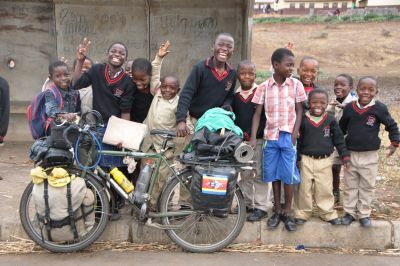 The idea to cycle around the world on a bicycle had never come into my mind by then. It’s hard to say how many times I have ever read it. A decade since then, 2013 in South Africa. Now I was taking a seat not in the rest room but on my bicycle and riding through the life to experience with a bicycle as much distance as Tatsu-san had done (San is a Japanese honorific title), which I had never even dreamed of. The distance one has covered or the number of countries one has visited, is not the first concern. Some people can be satisfied with just 1,000km and some can’t be satisfied with 100,000km. However, “55,000” has just always been in my mind. In Serbia, where the cycle computer scored 1,000km, ”The other 55 times”. When it reached 10,000km in Portugal, ”Another 5.5 times to go”. And the halfway point, at the border between Cameroon and Central Africa Republic, ”Still I’m only halfway…” “Tatsu-san, how far on earth did you pedal? ” Every time I have made sure of where I was at the moment using his distance as a standard. His book provided me with the thing that is worth a certain quantity of my lifetime. I wonder what I would feel if I read the book again now. Apart from the quality of the tour, I caught up with my icon only on the distance and now I don’t have any target for that. All I have to do from now on is just pedaling up to the point that I’m really satisfied so as to be able to say one day “I made it” from the bottom of my heart. My first contact with tiny Swaziland had given me such a big impression that I couldn’t help writing down the conversation I had had that day with an immigration officer in Josefsdal, a shared border with South Africa. He started a conversation while flipping over the pages of my passport. I replied with a traditional statement on my travel in Africa. Of course It was a joke and didn’t have any further meaning. He didn’t make a laugh at all and handed a package to me, close in size to that of biscuits. I turned my eyes down on the package and knew that it was a bundle of 10 pieces of condoms. I was surprised at his unexpected behavior and tried to return it to him laughingly. He added another package onto the bundle of condoms on my palms. I said to him while folding 20 condoms, but which seemed to have made him feel uncomfortable and he took away all of them from my hands. 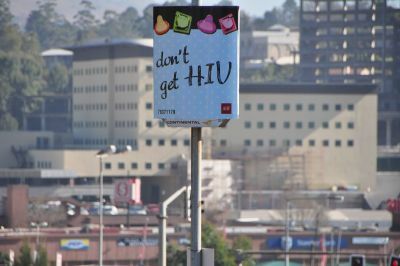 Swaziland has one of the world’s highest HIV infection rates, as well as the neighboring countries in Southern Africa. I had seen scenes in Botswana, of villagers praying for putting an end to the spread of AIDS. 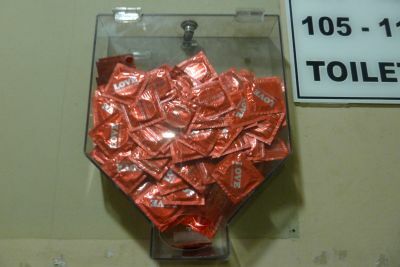 As is the case in South Africa and Lesotho, condoms were distributed freely in public places, like a municipal office or a dispensary, or even in the walkway of a shopping mall, though I was wondering whether the number of them was enough and if they reached the people who really needed them, which revealed the seriousness of the epidemic of AIDS in the area. Anyway, still I questioned whether they had the financial capacity so as to provide as many as 20 condoms to a tourist passing by like me. There was a large scale orphanage in a small town called Blembu, just after the border. 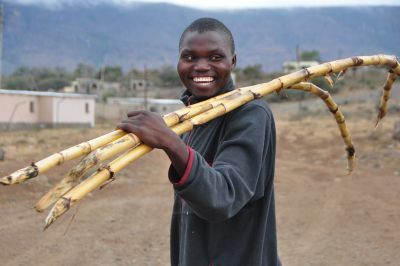 At dusk some orphans were walking around to gather firewood. Now that I think about it, most of them might have been orphaned by AIDS. They said that the women’s infection rates were overwhelmingly high in Swaziland due to the lowness of women’s status besides the lack of knowledge about AIDS. there is a traditional custom to present some cows at the time of their marriage to the parents of the partner as a betrothal gift with the expression of gratitude for their parental care. This is a source of concern to most of the young African men who can’t afford it. Normally in Swaziland they are supposed to prepare 18 cows (11 for African men in South Africa) per a marriage though the number changes depending on the status of the partner’s parents. I heard that the average price of a cow in Swaziland was 3,000 Emalangeni ( 375USD, about half or two thirds of the price in South Africa) . Unquestionably It is a great deal of money for them. Swati added with giving a horse-laugh “Likewise, you should be able to have at least five wives if you stay in Swaziland” I took that as a compliment but I thought it would be enough if I could have even just “one partner” in my life. On the third day of my stay in Swaziland with such national background, I had an opportunity in Mbabane, the capital town, to meet a lady, quite different from the ”weak and discreet” image of the Swazi ladies I had had until then. She was my Swati-contact that had been arranged by courtesy of my very kind host in Barberton, a gold mine town in South Africa, so that I could save money for accommodation there. Early evening in front of the town council, the meeting place for us, the tall lady came along a little late, dressed fashionably. She seemed to be in her middle thirties, a few years older than me.“Finally you arrived.” First of all she said. That morning I had made a call to her from some 70km before Mbabane and told her I would call again when I got close there. Soon after that she had left her house, about a half hour walk to the town, she told me. She was likely to have thought I came there by car not by bicycle. She didn’t know anything about me as well as I didn’t about her. 「Shall we go to the restaurant for dinner before leaving? I forgot to bring my purse but you have money with you don’t you?」Tough I had carried something to cook, I nodded with knowledge of what that meant and followed her after leaving my bicycle to a security guard in the Swazi telecom office as she suggested me so. I thought she wanted to go to fast food shop or such places, but she went in the big shopping mall where the modern shops lining up on either side, totally strange places to me. A fancy Chinese restaurant was seen just after going up the escalator. To nobody’s surprise her eyes were looking straight at the entrance of the fancy restaurant. It would have been the last place someone without purse could be allowed to come in. How could I have guessed this would happen? No, there had been no doubt in my mind from the beginning. I was looking for the right timing. And when we got short of the entrance finally I summoned up the courage to tell. Chilly air was breezing on the way to her place, which wouldn’t have been only because of winter or its high altitude. I was sorry that I had disappointed her expectations. She had expected a wealthy tourist to come with a classy car but in reality it was a vagabond who carried all essential commodities on his bicycle. Above all I felt kind of miserable and unworthy as a man. 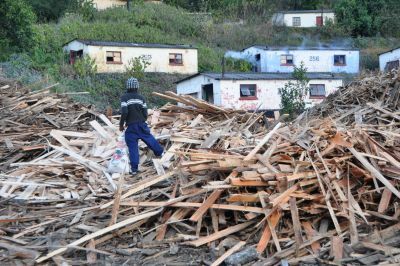 I thought of staying for two nights in Mbabane because I had some personal work I had wanted to finish. As I talked with her I knew she was kind and good-hearted person, however, I hesitated to ask her on the grounds that I was an unwelcomed guest. I pitched my tent in the compound of her apartment for a night and left. I didn’t ask but it seemed that she was single and living alone there. Her surname was Dlamini, same as that of the King MswatiⅢ. That is to say she was a member of the royal family. I was not strangely surprised when I heard that at first. The person without the nerve like hers would be unfit for the king. 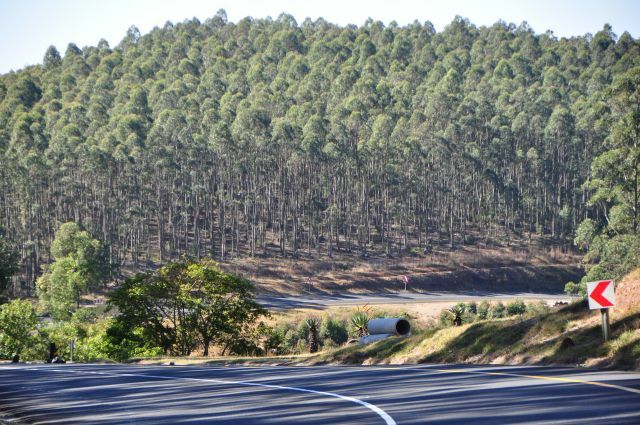 Once I left Mbabane altitude decreased rapidly and as I head east, the vegetation changed into that of the savanna region. 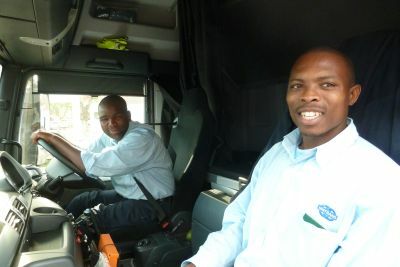 The reason of the reddish road surfaces was the transits of the iron-ore, carried by trucks to export it to Mozambique. 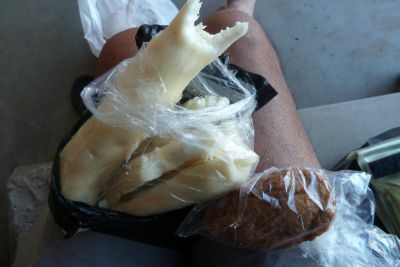 Cassava and “Bhajia”(fried bean cake) ,I had used to eat in Mozambique was sold on the roadside, tropical air gradually began to surround me. 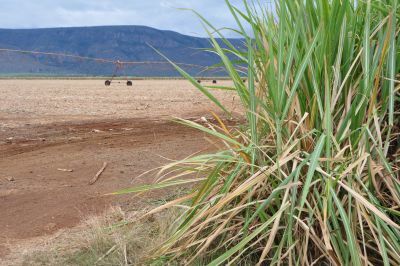 Right after cycling through the sugar cane fields South Africa already appeared on the scene. I took out my passport and went through the immigration control. I had been very much ready to say “I will find someone in South Africa” But unfortunately nobody asked me anything about that.